The Points System: How To Make Women Happy. THE POINT SYSTEM: HOW TO MAKE WOMEN HAPPY. Pay attention guys, I suspect this is pure gold. Now, in the world of romance and much of what happens on the way there, only one single rule applies: make the woman happy. Sorry guys, they lied. It’s not a man’s world. And yes, Beyoncé was right. Girls do run the world. So, this is how it works: you do something she likes, you get points. You do something she dislikes, you lose points. And no. You don’t get any points for doing something she expects. Sorry, that’s the way the game is played. They say love is blind, but I think it’s just deep-sighted. It makes you close your eyes and see with your mind. And that’s how you do me, Stranger; you make me see with my mind. Sometimes I see us, you and I, and we have neither past nor present, no unmet expectations, no broken promises; only possibilities. Sometimes I feel you when I see you in my mind, and you feel like a fresh start, like a new year resolution, like the anticipation, the space between two lovers just before a kiss. Sometimes, you’re like fireworks on new year’s eve. 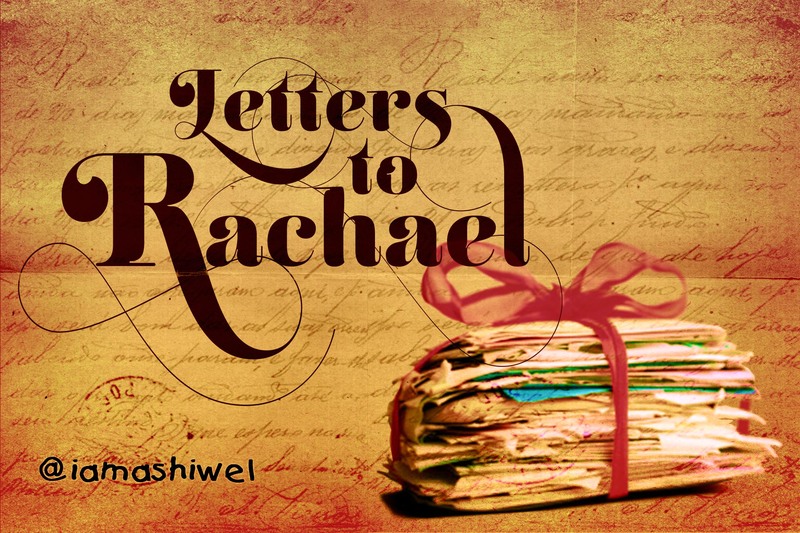 And let me tell you, dear Rachael, you’re a question I look forward to, the answer I will have to wait for, and I have waited; through diamond studded nights, and the humid dog days of crawling Lagos Januaries; through dinners with no date, and weddings with sixteen bridesmaids and no potential. I waited till time stood still and eternity crawled into my shell to wait with me. And so we sat there, curled up in the fetal position, waiting to be reborn, waiting to molt our hearts. But this is me, the unfeeling, adopted son of a fountain pen, who locked away his feelings and lost the keys. This is me finding courage to break the box. This is me emptying myself. Sometimes I wonder how I got here, but I’m not complaining. It’s been a long road and there were no signs. I’m just trying to save the memories that cling to me. Someday, you’ll help me tell this story. My fascination with healed wounds began as a little boy, through those endless primary school days, when after each football game and after each attempt to dive at the ball in style like I often saw on my neighbor’s black and white TV with the twin doors, I’d come home with at least four wounds. Yes. I counted. Mother was a Nurse/Midwife Tutor and like every mother with a growing child – she had three boys, she had developed and perfected her own special blend of drugs and blends for healing cuts, bruises and injuries of all kinds. I remember that one of her special ingredients was unprocessed honey, fresh from the mountains that made up the Obudu Cattle Ranch mountain range and separated Nigeria from the Cameroons. The alternative to the almost-weekly injuries was to keep me locked up at home and out of harm’s way, but that wasn’t Mother’s way. She wanted us to experience life and to live, so she raised her boys to learn from their experiences and mistakes, and from their hurt. And we did, because every time I got injured, I learned a new way not to dive, and the scar was there to remind me if I ever forgot. I invite you to recall with me, if you will, the personal stories of some of the most admired and respected people through history, people of character and charisma, people with that quiet, uncommon dignity that has become one of humanity’s most rare possessions. Bring to mind their strong souls, forged on the anvil of personal suffering or their willingness to partake in that of others; their individual characters, passed through the many purifying fires that burned away the dross and brought out the gold in them, from Abraham Lincoln, who is arguably the poster boy of how hardships and personal failure can be positive character-building forces, to Mother Teresa, the Dalai Lama, Nelson Mandela, Marcus Garvey, Martin Luther King, and all fifty-six signers of America’s Declaration of Independence. Recall their humanity and their self-effacing personalities, all of them seared with, but ennobled by the scars they bore. They could have hidden behind the memories of their wounds or booked therapy sessions to sit on a therapist’s couch and discuss their personal demons. But they took those scars and made something beautiful out of them and shared this beauty with the world, and we haven’t forgotten since. And it seems to me mankind could use some of that beauty, and grace, and character and temperedness right now, but we have refused the fellowship of scars and the world has suffered a hero drought. They were just ordinary people like us but the scars made them extraordinary. And I want to be like them. I want my scars to write my name in the stars when I go. It’s why I embrace them with an open heart. I wear them proud like medals, some of them conferred, not for victory but for valor in the face of failure and defeat. They are the keepsakes of my survived battles. Sometimes I tell myself I am a mother in labor: pushing through the pangs, suffering an episiotomy but pushing still, mind on the pleasure that is to come, embracing the pain, for pain is just a scar on my pleasure. So I invite life to cut me daily, with every risk taken, every step ventured further down the path less trod, with every stillborn dream I re-dream, every ruptured ambition patched; I take the wound and wait for my scar medal. Last night, I had a long candid conversation with a dear friend and it drifted like many of them do, to the places where we came from, to the place we were headed, to our dreamed future and the distance left to travel. In many ways she was just like me; growing up on the edge of dysfunction, memories weighted with emotional scars, personal demons put to productive labor. There is always a lot to learn from these conversations, and last night was no different. I have learned that wounds may leave a scar, but the scar is not the wound. The scar is simply evidence of healing, the mark of a closed wound. 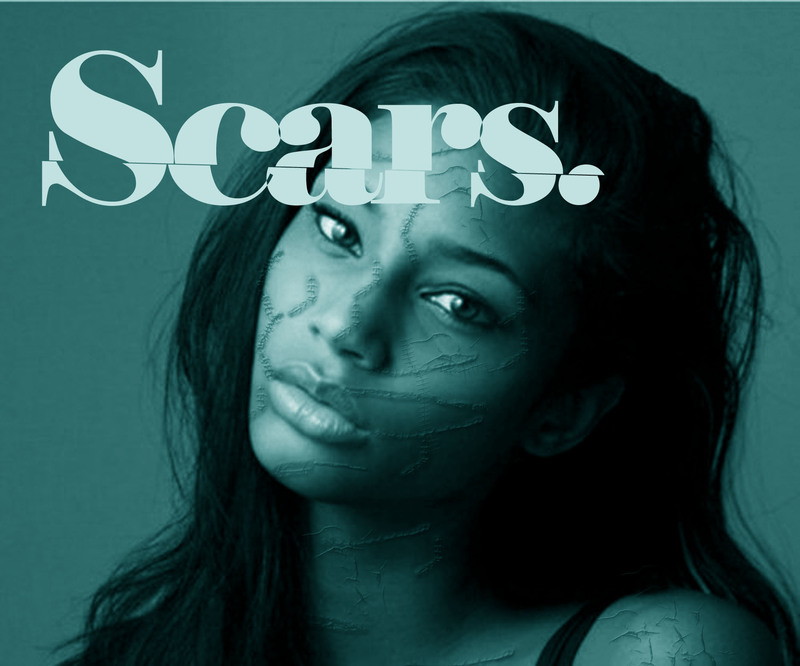 I learned that scars are not necessarily damaging, of themselves. It is only our response to their existence that determines their effect on us, and that response is often fear. But fear is a bullet in the spine, and makes mental invalids of those who will let it. I learned that life is a contact sport, and only the craven have no scars. Like Garrison Keillor once said, it’s a shallow life that doesn’t give a person a few scars. Thank you for reading, and I sincerely hope that this has challenged you. Kindly leave a comment if you can. I will appreciate that. If you are on twitter, you can follow me here: @iamashiwel and we can continue the conversation with a larger audience. Carpe Diem. They’re all in my head. By the light of a waning comet. The mental carnivores that chase me. But I lose me too. Or maybe you’re a free prisoner. And he’s been a poor artist. Perhaps I chose the painted colors. . I washed my unfamiliar face. So I punched the mirror in the nose. I was the only one who bled. I haven’t written or posted anything in a while. I’ve been really apathetic to everything lately and it’s not a very nice place to be. Perhaps this poem comes from that place? I’d love to have your thoughts and interpretations of it. Feel free to share them in your comments. Dear MTN, I Am Nigerian. Don’t Mess With Me. Hi. My name is Ashiwel, and I am a Nigerian, just like you. I have dreams, and fears, and insecurities, and hopes and wishes, just like you do. I do all the regular things young Nigerians do: I blog (ashiwel.wordpress.com), tweet (@iamashiwel), have a facebook account, and bash the government when they misbehave. I also complained about the quality of service delivery but did nothing about it…until now. But I am a Nigerian consumer, just like you, and I had no idea how much power we had…until now. We are the largest market in Africa, and the world knows it. They recognize it and they fall over themselves to market to Nigerians. Think about it: Nokia, Blackberry, Toyota, Honda, Microsoft, and a host of others recognize Nigeria as a crucial market. If we the Nigerian consumers sneezed, I promise you, a lot of people all over the world will freeze to death. For instance, Nigeria is arguably Nokia’s largest market. If all Nigerians decided not to buy Nokia until they reduced their prices by 20%, will they pull out their phones from the Nigerian market, or will they reduce their prices? But then, I wanted to talk about MTN Nigeria, Not Nokia. With the connection at a really low point, Blackberry services down on a regular basis, and yet another apology to it’s “numerous” customers, I just wanted to show you, one of the numerous customers, what you have done for MTN. As at June 2011, MTN had 40.5 million subscribers, and between March 2001 and December 2010 MTN Nigeria made a total of N2.988 Trillion (twelve zeros). After taxes and other deductions, they declared a profit of N857.655 Billion. So let’s do the math. If you exclude the first year, in which they declared a loss, then the company makes a profit of nearly 100 Billion Naira every year. Profits are what they take home after paying taxes, staff salaries, directors salaries and allowances, and all the deductions for running their cars, network infrastructure, buying diesel for their generators, etc. N100 Billion. Over 52 percent of phone users in Nigeria use MTN. They operate in 21 countries including South Africa, Iran, Ghana, Cyprus, Liberia, Côte d’Ivoire and Britain, and yet Nigerian subscribers alone make up 26.6 percent of their subscriber base in all these 21 countries put together. So we ‘dash’ MTN Nigeria N100,000,000,000 every year to get crappy network, poor service, dropped calls, erratic blackberry internet subscription, some of the most expensive call rates in the world, and apologies to their numerous customers? Is that how foolish they think us? Is that how insignificant we are? I am a Nigerian consumer, and I deserve the best I can get, especially if I am paying for it. And if the CPC won’t do something, or would rather enrich their coffers while you the Nigerian consumer continues to suffer, maybe we can make our own voices heard. So, this Saturday, 7th July 2012, for five hours, from 10am to 3.00pm, I will be switching off my MTN phone in protest. I just want them to know that I can take away that 100 billion. I know, some might be tempted to brush this aside and say it’s not their problem. I know I may be a drop in the ocean; just be one lonely voice, but imagine if 40.5 million MTN subscribers switched off their phones for 5 hours. Imagine what message we would be sending to them. Imagine what we could do with this new found consumer power! If you join me, we can, and will make a formidable consumer force. Because we don’t need MTN to apologize anymore. We don’t need them to be sorry. We need them to be different. We need them to give us the service for which we pay them a hundred billion each year. But that’s another chapter. History made, history forgotten. There were a million reasons why she loved me, and between our two million reasons, we couldn’t find one to make it work. And it’s the same with you, is it not? You have tall dreams too, and pretty plans for the future, and fights, and make-ups, and poetry, and you make disney valentines too, and endless phone calls, and have miss-you-nights, just like we did, don’t you? I remember the gradual introductions; first, we met the friends, then we spoke to some of the family over the phone, then we met the closest sibling, and after that, the understanding parent (whose approval would be subsequently conveyed), and we made an eternity of memories, and had more fights, and talked about marriage, and argued about how many kids we wanted, and whether to have or not to have maids. Just like you have. And we said “I love you” every day just to remind each other the love was still there, and then we broke up, just like you’re about to. And when you do, you will find a million reasons to justify the break-up: maybe we weren’t meant for each other; maybe we weren’t in the same social class; maybe we needed someone more mature or more understanding. And you will definitely use the all-time breakup classic: it’s not you, it’s me. Just like we did. You will dig up sins that had been forgiven, and unforgivable ones. You will play emotional and social politics with it, and tell the story in a way that makes you look good. Just like we did. So as I watch you stand on the threshold of your own version of our forgotten forever, heading down the same road we went, I just thought I’d tell you a few things, the real reasons why we recycle lovers, and relationships. And why you’re about to recycle yours. They say love never dies, it just grows cold. But is cold love not an euphemism for dead love? A cold fireplace has no fire because the fire’s dead. Cold water has no heat because the heat is gone. To keep the heat, or the fire, or the love hot, you’ve got to stay committed to keeping it hot. You’ve got to stoke the fire that warms it. You’ve got to fan the flames, you’ve got to get smoke in your eyes. I’m just saying, the only reason it doesn’t work is because we either do not understand what it takes, or are not willing to give what it takes to make it work. We base relationship foundations on the hollywood-derived notion that love should be easy and effortless, and smooth. And it is. But human nature is not. It is fickle, and fundamentally flawed, and full of behavioral and character imperfections. People come from different backgrounds, and have different world views, which have been shaped by different experiences. And they all interpret life, and love, and loving differently, based on their own unique experiences. Even two people from similar backgrounds will respond differently to the same set of interpersonal relational stimuli. But getting to understand a person who interprets life based on a different set of experiences is a long, sometimes frustrating but worthwhile chore, and we often give up half-way to the goal because we lack the strength of character and the determination to commit to the task. So we begin to make mountains out of mole hill mistakes. We magnify flaws, and blow up differences and make it look like they grew up overnight, but they were always there, we just didn’t notice because, at the time, we were too committed to loving to notice anything else. And when you finally get to the point where you say, “it’s not you, it’s me”, you have no idea how true that usually is. I’m only just trying to say that broken relationships are not as much a failure of love as they are a failure of commitment, as well as a lack of understanding, or an active or passive unwillingness to give what it takes to make it work, either on the part of one or both. Understand then, that in relationships, you cannot make yours work off of the same set of rules by which your friends make theirs work, for every relationship is as individual as the parties that constitute it. I agree that there may be certain generally applicable principles, but hold none to be axiomatic, or general-fit. There are no templates, no directional signs, no maps to your intended destination. This is virgin territory, a frontier waiting to be explored and mastered. You have to find your own way, to make your own path, to create your own intertwined destinies. There are no prefabricated parts and you have to build your relationship from the ground up. You have to improvise as you go along and make your mistakes into life lessons. And a relationship founded on love is not a meet-me-halfway alliance. It is not a 50-50 contract of romantic relational give and take. True love gives everything until there is nothing left to give. Then you find some more to give. You don’t love because you are loved in return. You don’t need some sort of justification to love. You love, just because. I know, I know. Your friends keep telling you that what is yours is yours and it will come back to you no matter where it goes. And somehow, that mentality seems to have forged a lackadaisical attitude towards the relationship. I see how you become infested with the spirit of “see finish”; that nonchalance that creeps in when you take for granted that someone will always be yours. But you know it’s not true right? You know it’s not true because what is yours can be stolen, or lost to carelessness, and while you may forever consider it yours, it doesn’t change the rather apparent fact that it’s gone. And because we always give a little bit of ourselves to every real relationship, when it breaks, a part of us breaks with it. But let’s not get too distracted; we were talking about you, right? You remember that time in the beginning, that time when you would’ve gladly caught a grenade for him; those early days when you would have died a million slow deaths for her? You remember how, before the “see finish” thing set in, before the novelty wore off and you let the freshness go stale; you remember how colors seemed to fade when you missed your love for too long? Remember that time, how when they asked you what love is, and you had said, “Love is what I feel for my baby”. And there was that time too, when they asked you why you loved him like that; why you loved her like that? You had a million reasons, but the smile said it all. It’s not like it’s my business much, but I was just wondering, before you waste all that love on trivial things; before you throw it away or trade it in for the brokenness of another failed relationship; I was just wondering, where have all your reasons gone?